A Gumption Trap is an old school name for an even older idea, coined by Robert Pirsig, in his famous hippie book Zen And The Art Of Motorcycle Maintenance, published in 1974. It happens when the unforseen occurs, and wrecks your plans, and all your motivation along for the ride. That’s why it’s a trap, because it tends to make you stall. But it doesn’t have to end that way. And if you’re wise, you can avoid them altogether. The cause … is projection. 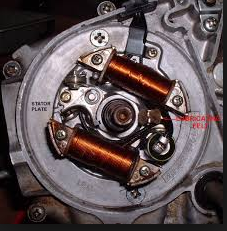 Pirsig uses the example of his experience adjusting the ignition points on his distributor for his motorcycle. There are pieces of metal that make the connections that deliver the power to the spark plugs in a choreographed way, and they can shift with use so the timing isn’t correct and the engine will run roughly. 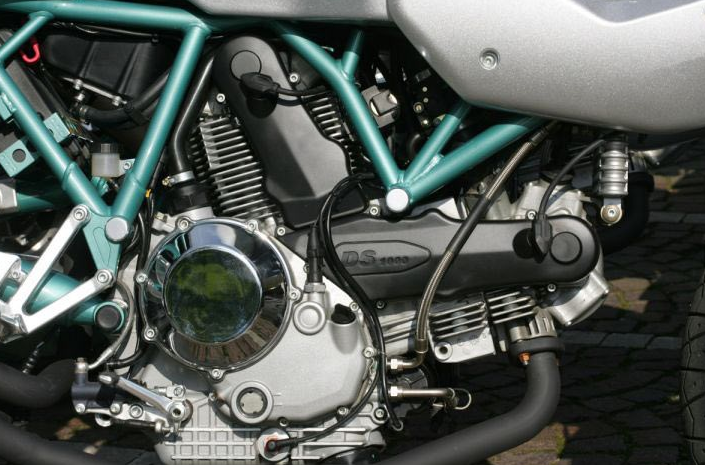 When adjusted, the engine runs more cleanly and with more power. They are inside the circle you see, looking at a typical motorcycle from the side. Well he was starting the project, laying out his tools, getting ready to clean the parts he removed as part of the procedure. His coffee was made and he had some music playing. He’d done it so many times it was kind of like a ritual, even relaxing, similar to how equestrians feel grooming their horse before a ride. Because he was so familiar, his mind was already way ahead of the process, thinking about the adjustment as he started removing the cover, and envisioning the test ride, since it was a warm spring day … and that’s when he stripped out the screw on the cover. He didn’t pay good attention, and destroyed the screw, which means he’d have to deal with a broken screw before he even got to start the adjustment. Just like that, the process that is supposed to take 30 minutes, tops, would need a whole different set of tools, and more time, and a new part … and it just sucked to be there, because he was already looking forward to a ride that was not going to happen on schedule. His mind was literally not on his work, but ahead of it, and the work suffered for it. And once he saw his situation, it literally sucked away his motivation and left him feeling angry and disillusioned. The illusion was his projection in time, forward, past the process. It’s why he wasn’t looking properly at the screw. This is the basic idea of a Gumption Trap: something springs up in your work, and it wrecks your day and makes you want to give up, in part – or perhaps mainly – because it’s your own dumb / damn fault. You’re about to merge into traffic when someone else moves into the gap you were aiming for. Your vision of the future situation created feelings of ownership, so you feel a loss when someone gets there first. You get a wrong answer on your test, and because it bothers you so much, you lose focus and miss three more in a row. Some people worry so much about things that might happen that they never get around to creating the things they want to have happen. “Fear of failure” is the common name for that one. Projection is a normal human brain function, required for consciousness. Our sensory systems have delays built in – it takes time for our neurons to communicate all the way to our awareness. Yet everyone feels as if they live in the now, despite the evidence that we certainly cannot. The Flash Lag Effect is definitive as evidence: everyone has senses that can’t be real time. Conscious awareness is capable of even less data bandwidth. Thus we can conclude that our brains project our first-person point of view forward in time in order for us to consciously anticipate events based on what we know from experience will happen, and sometimes we start responding before something occurs. Professional athletes make millions of dollars from their ability to make split-second decisions. And that ability is mainly a pre-frontal cortical skill – tactical skill, like Patrick Mahomes’ – honed over time by abundant experience with the details. Life is literally a type of dream; our sense of our place in the world is mostly a construct of imagination, albeit one made from and tested against real experiences. Projection is normal, even required. Empathy itself requires it, to imagine yourself in someone else’s place. If you project your imagination somewhere besides where you’re working, where your hands and eyes and voice are, you risk a Gumption Trap. It also makes you seem flaky if it happens when you’re talking to someone. “Learned helplessness” is a modern name describing someone caught in a series of them or who deliberately lands in one as an escape mechanism. “Keep your mind on your task” is a common piece of advice for a reason. “Mindfullness” is the modern catch-phrase. Now you know how to recognize when you’re not, the nature of the common pitfall when you’re not, and a great name for talking about it. “Pay attention to your senses” is the second step on the three part recipe for excellence in anything, too. Wait, what if you lost focus at the wrong time, and ended up in one? Then what do you do? When they don’t deal with their grief well, or at all, it can wreck their next move, the rest of the game, a whole season or possibly even their entire career. Tiger Woods can confirm. PreviousPrevious post:What purpose do humans serve here on Earth?